Blockchain has the potential to change the world we know. It is a disruptive technology that has been around since 2009, when Satoshi Nakamoto introduced it to create and deploy the Bitcoin cryptocurrency. Why is this technology so important? Well, Blockchain makes it possible to have a decentralized consensus over the transactions being executed, without the need for central regulatory bodies (governments, banks, etc.). So, what is it exactly? Imagine that you are an actor and you are performing on a stage with 10,000 people in the audience. Imagine that all those 10,000 people are filming you when a thief comes on stage and steals your wallet. All the recordings, clearly and without a doubt, show that the thief stole your wallet. Now, for the thief to claim his innocence and escape with your wallet, he would have to convince all those 10,000 people, before the police arrive, i.e. in a few minutes’ time, that their videos aren’t telling the truth. What are the chances of that happening? Moreover, imagine that those 10,000 people who filmed the theft were located all over the world. The thief would need to reach all of them within a few minutes and make them state that their video is not reliable. Pretty complicated, right? Replace the 10,000 people at the concert with Blockchain miners (the nodes of the Blockchain network that validate the transactions), the videos with the Blockchain cryptographic function, and the wallet with the transaction being validated and you have an idea of how Blockchain provides decentralized trust. Taking the Bitcoin Blockchain as an example, you can send money interstate at a fraction of the cost (currently around $10) involved when sending money using bank institutions (currently $10-$50). This is because the Blockchain itself will take care of the validation of the transaction. In a way, the Blockchain ensures the transaction and replaces the trust currently given by the banks’ clearance mechanisms. Let’s consider the main elements of the Blockchain. 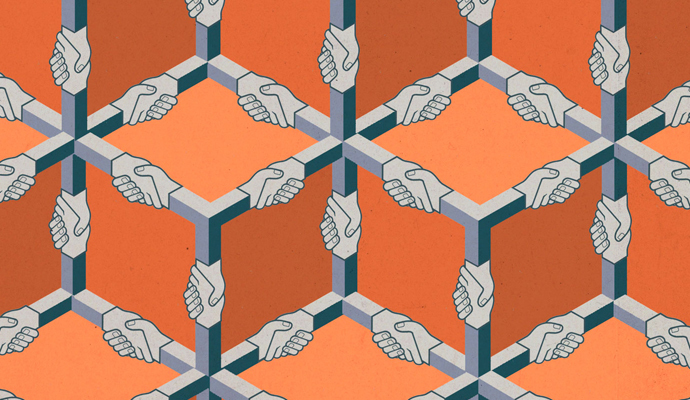 The Blockchain can be seen as a peer-to-peer network of replicated databases, each containing the same list of past transactions. Everybody in the Blockchain can see all the past transactions. And everybody agrees that those transactions actually happened. The peer-to-peer network itself provides the security of the Blockchain. Anybody trying to hack a transaction would have to make more than 50% of the miners agree to the counterfeit transaction. To date, the Blockchain hasn’t been hacked. The Blockchain has an immutable database, in which it’s only possible to write new lines after they are validated by the miners. Once a transaction is executed and validated by the miners, it’s impossible (unless there is a manual hard fork in the Blockchain) to revert and, thus, impossible to contest. Let’s imagine that I gave you $10 worth of money via the Blockchain. Miners will be the ones responsible for the validation of that transaction and for writing into the immutable ledger. In practice, miners compete to resolve a difficult computational problem. The computation itself is a guessing game, in which miners need to guess a number, which, when crunched with the rest of the block data content, results in a hash/fingerprint that is smaller than a certain number. As soon as a miner solves the guessing game, the transaction is considered valid and a new immutable line is written into the immutable ledger. This newly resulting ledger (database) is propagated through the peer-to-peer network and all subsequent validated transactions will be added to this new database. You should have a question now: Why should miners validate the transactions? The action of validating the transactions is called ‘proof of work’ and is computationally expensive. Electricity constitutes around 90% of the energy required to work on a validation. So, what is the miners’ incentive? Well, the miner that solves the cryptographic problem – and validates the transaction – is given a fraction of the Blockchain value (BTC in the case of a Bitcoin Blockchain). Blockchains can be public or private. In a public Blockchain, everybody can become a miner and start validating the transaction simply by downloading the file containing the immutable database and some core software with the Blockchain cryptography. Let's take the example of smart contracts. Imagine that you have just bought a car and you are supposed to pay for it in $1K monthly repayments. You have also signed a contract stating that if you are not able to repay your loan for more than three successive months, the car should be returned to the car dealer. Now, with Blockchain-powered smart contracts, this process can be fully automated. After the third month of unsuccessful payments, the smart contract will automatically deactivate your car key and activate a key owned by the car dealer, so that he can go and collect the car wherever it is. The number of new applications made available by the Blockchain technology is just enormous, but I will leave those for another article.